?St. John the Baptist Baptizing Christ? Adam Glück, Augsburg, dated 1675. Very fine single-hand pre balance-spring rock crystal watch. 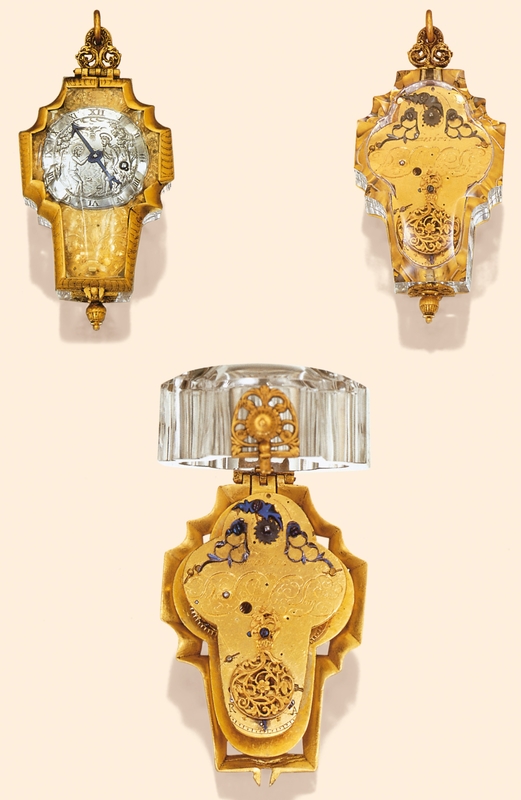 C. Single piece of rock crystal formed as a cross, gilt finial, swivel pendant, loose ring, gilt hinged bezel with faceted rock crystal. D. Silver, convex, champlevé Roman numerals, center engraved with St. John the Baptist baptizing the Christ. Single blued steel arrow hand. Adam Glück Was a well known Augsburg watchmaker in the mid-17th century. The current watch is unusual as it is dated. A very nice tulip-form watch by him is in the Musée National de la Renaissance (inv. E.Cl. 20707).